Staff at the Palace Theatre are celebrating news that this year’s pantomime – Aladdin – has been their most successful ever. Starring household names like Strictly Come Dancing’s Robin Windsor and Michael Auger of Britain’s Got Talent winners Collabro, the show broke all records. More than 18,000 people saw the production snapping up 92 per cent of all seats, netting ticket sales of close to £300,000. The headline performers were supported by a stellar cast including Simon Howe – a third generation panto dame – funnyman G as Wishee Washee, Darren Clewlow-Smith as the arch baddie Abanazar, the fantastic Louise Cannon as Princess Jasmine, Hattie Parker who stole the show as the Spirit of the Ring and Ryan Taylor’s hilariously silly Emperor of China. 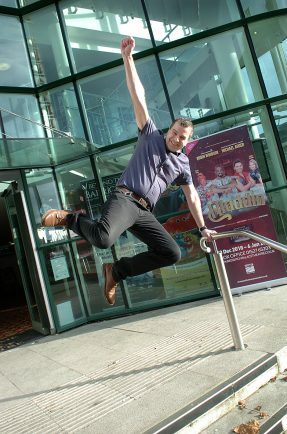 Paul Hughes from the Palace Theatre said the secret of its success was down to offering a good traditional family panto where people knew they’d be well entertained. “It’s about being involved and inclusive – you don’t have to struggle in to Birmingham or feel short changed if they’ve been to one of the big arena pantos. The Palace is right on your doorstep,” he said. Another plus is the sheer professionalism of the Palace show. This year’s panto was a dazzling spectacle, a feast for the ears and eyes, while the jokes – for both children and parents – made sure the laughs didn’t stop. “There is nothing like live theatre and our panto had comedy, pathos and adventure, and of course our flying carpet!” said Paul. The success means that the 2019 panto, Cinderella, has a lot to live up to, but it’s already got off to a great start with more than 3,700 tickets sold purely on the strength of Aladdin. It runs from December 9 to January 5 with the stars due to be announced in the spring. For tickets call 01527 65203 or visit Palace Theatre online.